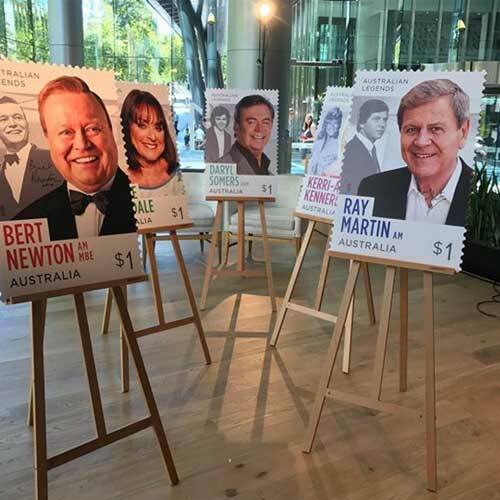 Popular Australian TV legends Bert, Ray Martin, Kerri-Anne Kennerly, Daryl Somers and Denise Drysdale have all been commemorated with a new set of stamp releases. The stamps feature portraits of the personalities of "then and now" along with a text which reads 'Australian Legends'. Pictures of the stars were posted on the internet along with large-sized models of the original stamps. The TV legends and their dear ones were all thrilled about the new postal release. The special postage stamps were launched at the Official Australia Day Luncheon. The Australia Post stamps have honoured several other famous personalities like the leader Tom Calma, tennis champions Pat Rafter and Lleyton Hewitt, and music legends John Farnham, Kylie Minogue and Olivia Newton-John.